I always find my favorite time to dress up is the holidays. There are so many various styles to choose from depending on the occasion. 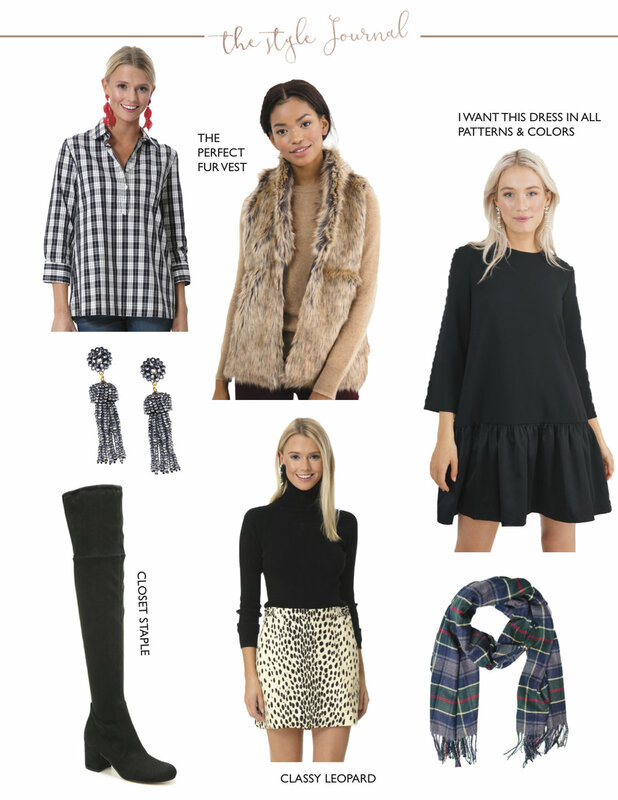 By focusing on plaid fabrics and colors such as navy, black, white, red, and green, I can bring together a perfect holiday look. Simply sprucing up your everyday outfits by featuring sparkly jewelry or a plaid scarf makes all the difference. For shoes I tend to go towards chunky suede pumps, over the knee boots, and booties (I'm not much of a stiletto girl, but if I could rock them for hours I would). Most importantly, have fun with your looks this holiday season! These looks make me the feel happiest as they remind me of all my favorite holiday traditions such as decking out my home in decorations & having leftover turkey sanwiches for lunch the day after thanksgiving. This Plaid Top is perfect for dressing up with a sparkly necklace & some faux leather leggings, or dressing down with a cashmere cardigan and distressed denim. I've been searching for a Fur Vest and I think this one is just right. The warm brown and golden tones compliment any outfit. After discovering Lisi Lerch through Lonestar Southern, I've been obsessed. Her jewelry is the perfect holiday gift, maybe even a gift for yourself! These Lisi Lerch Earrings spruce up you look effortlessly. I recently purchased these Over the Knee Boots and I plan to get a ton of use out of them! As a staple closet piece, they can be paired with denim, skirts, sweater dresses, etc. I'm not much of an animal print person, however this Leopard Skirt is a classic. Wrap up in a scarf to keep you warm all season long. This Barbour Plaid Scarf creates a traditional country look.